Cysteine with it’s sulfhydryl side chain is highly unique within the functional suite provided by the naturally occurring 20 amino acids. 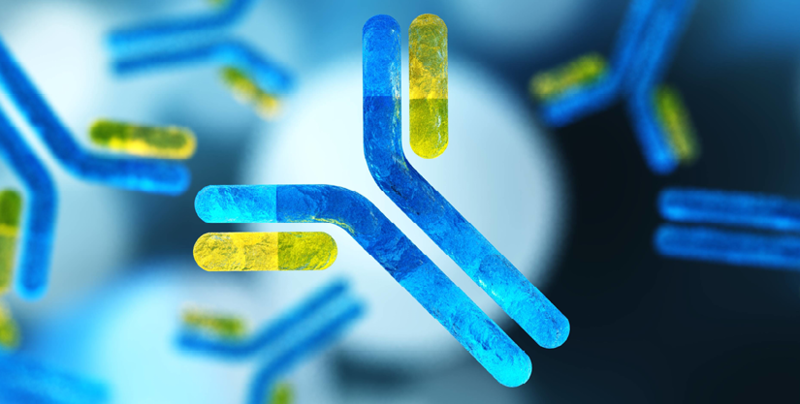 However these attributes can complicate the situation when handling synthetic peptides that contain cysteine. There are really two areas to be concerned about: 1) the side chain protecting group with any side reactions it may participate in and 2) the reactivity – or potential to be oxidized – of the unprotected thiol. To demonstrate the importance of the side chain reactivity (oxidation potential in this case) I synthesized oxytocin, a 9 amino acid peptide containing two cysteines within the sequence. The biologically relevant form of the peptide contains a disulfide bond between the two Cys residues, but for this and other experiments I was only interested in the linear variant. For the first synthesis, I used standard Fmoc-Cys(Trt)-OH and DIC/Oxyma coupling chemistry to synthesize oxytocin using my Biotage® Iniator+ Alstra™ peptide synthesizer. Once the synthesis was complete I prepared a cleavage cocktail containing 2.5% triisopropyl silane (TIS), 2.5% water, 2.5% 1,2-ethanedithiol (EDT), and 92.5% TFA, Figure 1. 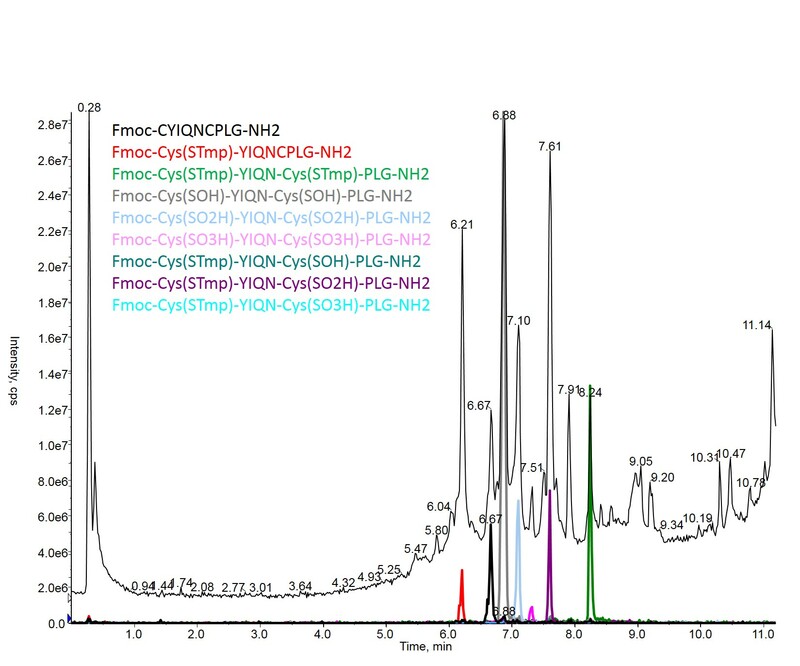 Figure 1: Crude analytical chromatogram of oxytocin synthesized with Fmoc-Cys(Trt)-OH and cleaved using a cocktail containing EDT as a reducing agent. The synthesis turned out great! A crude purity of >85% is nothing to bat your eyes at (ok fine, I know it’s only a 9mer…). The critical factor here is the presence of EDT whose role is to maintain cysteine residues in a reduced state during the cleavage reaction. Cysteine is prone to undergo oxidation – forming undesired inter/intramolecular disulfide bonds, or simply oxidizing to sulfenic, sulfinic, or sulfonic acids with simple exposure to air, Figure 2, and the EDT prevents these reactions. Figure 2: Oxidation states of cysteine. So how bad can it really get? I synthesized oxytocin, this time incorporating Fmoc-Cys(STmp)-OH with essentially the same conditions (the number of equivalents was reduced a bit to conserve the expensive Cys amino acid). This time though I used a cleavage cocktail containing 2.5% water, 2.5% TIS and 95% TFA, Figure 3. 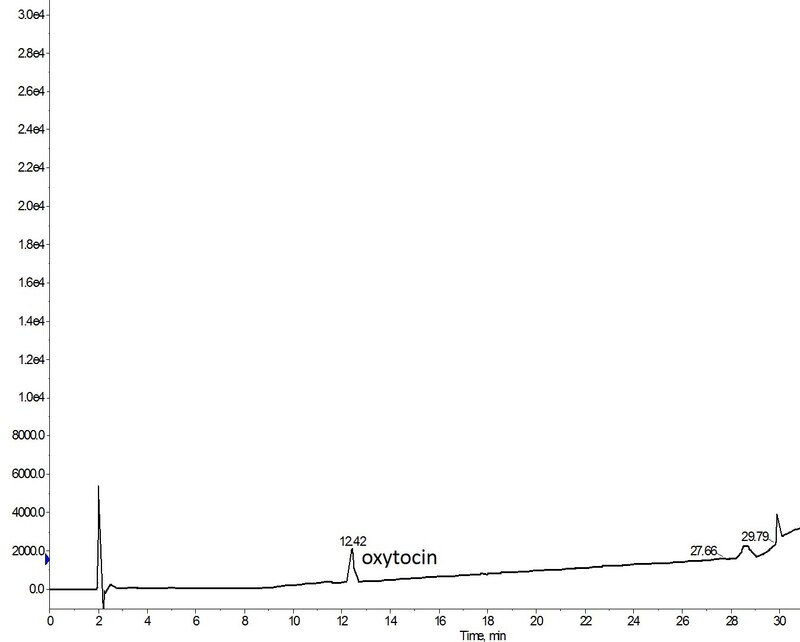 Figure 3: Crude analytical HPLC of oxytocin synthesized using. Fmoc-Cys(Stmp)-OH. The desired product peak is indicated by the orange arrow. If we start extracting unique ions from the total ion chromatogram, it becomes very apparent which of these specifies exists, Figure 4. 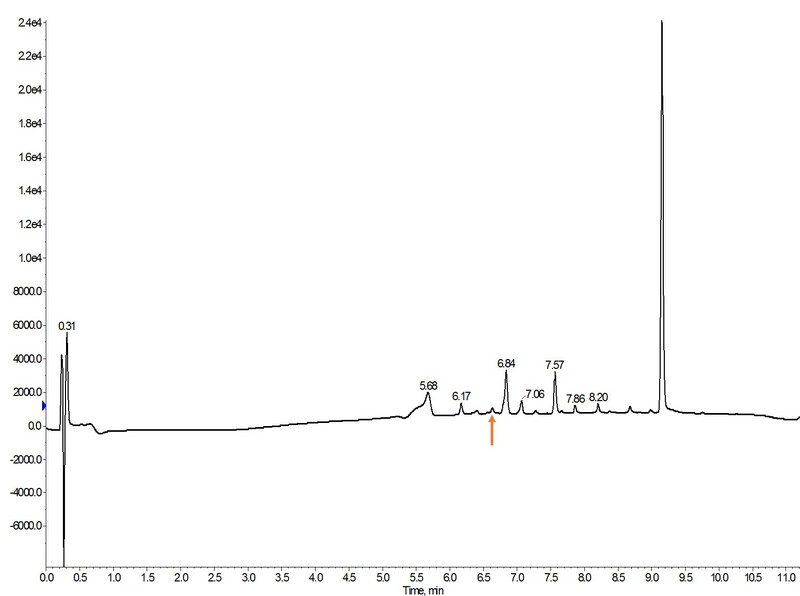 Figure 4: Overlay of the crude TIC (black) with the extracted ions for each of the listed compounds. The predominant TIC peaks (and associated UV peaks) can easily be assigned to 7 of the 9 listed compounds.While many of these modifications can likely be reversed, the fact remains that the desired, unmodified peptide is the least abundant of the species present (black XIC, orange arrow Figure 3). Leaving the reducing agent out of the cleavage cocktail has now added several chemical and potentially additional purification steps to the workflow required to recover pure oxytocin product. Lesson learned! How have you modified your cleavage cocktails to prevent cleavage-related side reactions?